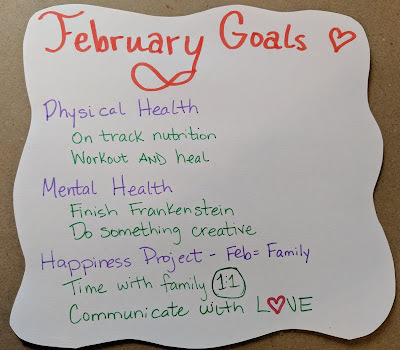 It's time to set my goals for February. I thought about skipping it but realized that I won't accomplish anything if I don't write down what I want to achieve. I need to write it down and tape it up and make myself accountable. Workout 4-5 days per week with a focus on weight lifting (Beachbody's LIIFT 4). I will pay attention to my body and not push beyond my capabilities. I will stick to better nutrition. Vegetables, proteins, fruit, whole grains. Avoiding junk and processed foods. Reading is good for me and I need to commit to it. I need to finish Frankenstein. I want to read On The Come Up (new book by Angie Thomas) and Thunderhead (book 2 in the Arc of a Scythe trilogy by Neal Shusterman). So my goal is to finish Frankenstein and then I can read the other 2 as my reward. I also want to do something creative. Last night, before the kids went to bed, we lay on the floor and drew. Just doodles and random things - but it was really fun. I want to be sure I do something creative this month. In the book, author Gretchen Rubin uses February to focus on her marriage. I won't say that my marriage is perfect and all important relationships need ongoing work. But I don't have specific goals that I think need focus this month in my marriage. However, my relationship with my kids does need some focus. Teagan is a teenager and some days we are very close and some days she pushes very hard. Zach is moving into more activities that I don't understand (video games) and I find that my attention more easily goes towards Teagan. So my focus in February is going to be ways to keep relationships strong with my kids and with my husband. Focus on loving communication - especially with Teagan when she is "teening"